On 6 December Sara was called to participate in SAR mission. She again went only with her Cap, because Myf is pregnant and quite fat already :-). The mission took place in Sestine (part of Zagreb) and they were looking for a female person, about 30 years old, whose disappearance was reported by her friend day earlier. Sara and her colleague Zvonko Seb, from KOSSP Zagreb, had to search in very steep sector, which was quite far away from the place where, eventually, Croatian Rescue Mountain service found missing lady, around 12 o’clock. She unfortunately was not alive. 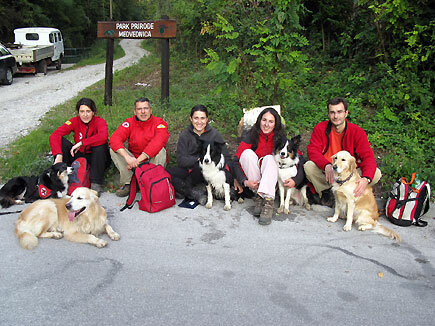 On 15 November 2009 Sara and Myf competed in SAR RH-FL/B exam in Nova Gorica (Slovenia). 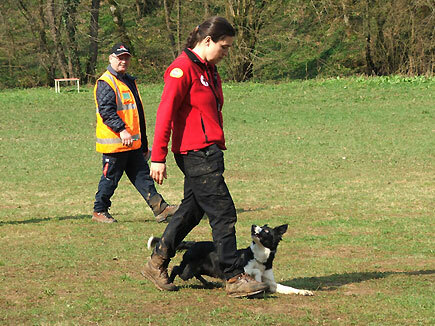 Searching and dexterity part of exam were judged by Jerneja Ternovec and obedience by Katja Skulj. This time Myf found all three persons and gained 176/200 points. Most of the points she lost she did because her barking at two hidden persons was inconsistent and not so good. 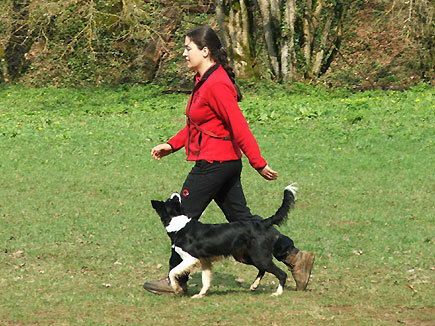 But, Sara was generally pleased with Myf's work, with ability to direct her and her will to search the area. Dexterity work did Myf almost perfectly and got 48/50 points (Sara lost points for two additional unnecessary commands). In obedience Sara and Myf got 44 point. This time the crawling ("the problem" they had before) was perfect, but "sendaway" was again too short and also Myf lied down from sitting position when she heard the gun shot. Sara and Myf were second placed in this competition and the best dog was again Myf’s aunt Mona and her handler Ana Viller. Mawlch Lars with his owner Petra passed RH-FL/A exam with excellent 196 points for searching work. Congratulations! On Sunday, 18th October 2009, Sara received a call for participation in rescue mission. 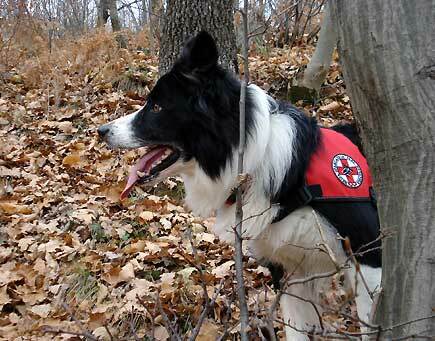 On Friday night, one old and ill lady, with brain tumour, walked away from her home towards neighbouring woods. 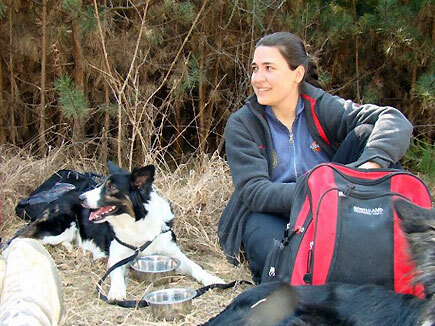 Sara went to this mission with her Cap, who although now barely trains SAR, showed that he has enough strength, will and knowledge for missions that last for hours (Myf was, unfortunately, with Alen, working with sheep about 100 km from Zagreb). Together with Croatian mountain rescue service and local people, they searched steep slopes of Mount Medvednica above Podsused. The weather was ideal for searching, cold and windy, so the dogs didn’t get tired fast and the wind encouraged them to go deep in the searching area. The search was finished with no success in the evening hours. It was continued the next morning, when the lady descended (alive and healthy) back to the village, without knowing where she was or from what part of wood she came back. 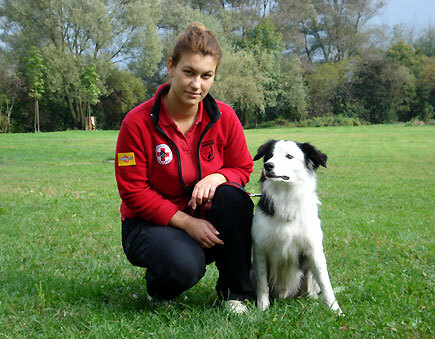 On 9 and 10 October 2009 Sara and Myf participated in IRO SAR exam/competition, organized by DVRPS, in Ljubljana. They competed in area search, RH-FL/B. Myf first had to complete the searching part of the exam. Sara was very content, because Myf searched all the time happily, independently and Sara could direct her without problem. Myf quickly found two persons without any problem. The last person, sadly, she could not find, although Sara was quite sure about where he was. It was a quite big scrub, which Myf sniffed from all sides, ran around it many times and randomly went into it, but unfortunately she just couldn’t catch the smell of the hidden person. Sara believes that the reason because it was so difficult for Myf to catch the smell was the fact that there was no wind, it was raining (so the person’s smell was falling to the ground) and even the bush had its own intensive smell. But despite of the fact that they did not pass the exam Sara was very happy because Myf did her job very motivated and nice. For dexterity and obedience Sara got 44 and 46 points. 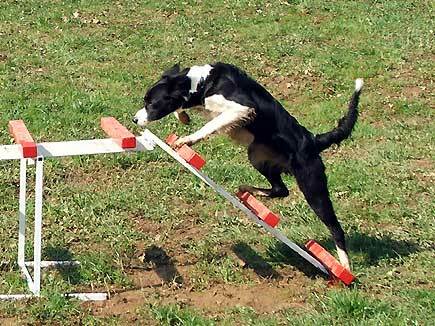 Mawlch Lars also participated in this competition and he was one of just few dogs who successfully passed this time very difficult RH-T/B exam. Sincere congratulations to Petra and Lars on their success! SAR World Championship took place from 1 to 5 July 2009 in Romanian town Craiova. 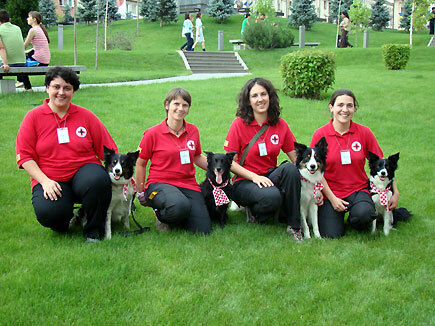 In Croatian team from KOSSP Zagreb there were three Border Collies from Mawlch kennel: Myf, Loch and Lynn. Unfortunately none of our dogs found all three hidden persons in area search, so this year we went home without placement. Myf was searching very poorly and Sara was very disappointed with Myf showing reaction on Sara's nervousness. Myf was not going deep enough in searching area and she behaving very dependent. 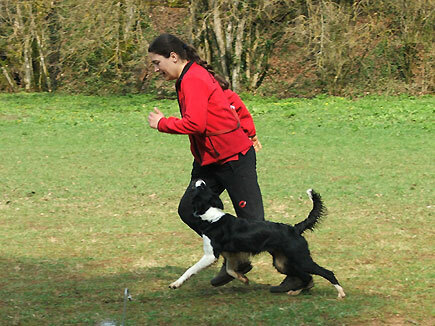 Dexterity and obedience part Myf did quite well, but it was of no importance because of unsuccessful searching part. Loch and Lynn did their job very motivated, but mostly because of handler’s inexperience and hot weather, unfortunately they did not complete their searching as well. 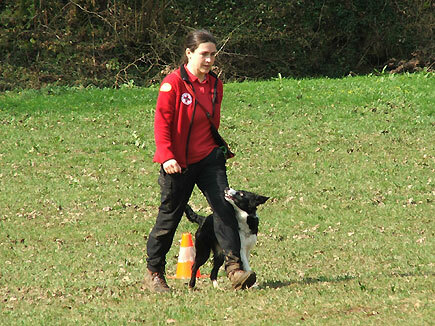 On Sunday, 5 April 2009, Sara and Myf went to Novo Mesto, town near by, in neighbouring Slovenia, where they participated in search and rescue test/competition. Organizer was dog club K9. The test was again area search of 2nd level (RH-FL/B). The forest in which they were searching was ideal for test: there were both flat and steep parts, in some part covered with very dense vegetation and in some parts Sara could easily see where Myf is running. This time also Myf has found all 4 hidden persons and gain 194 points (out of 200) for searching part of test. 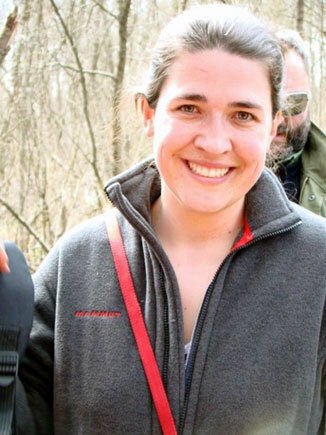 She lost points when Myf, already tiered, barked with somewhat lower intensity and because, in judge’s opinion, Sara didn’t search one small part of area well enough. 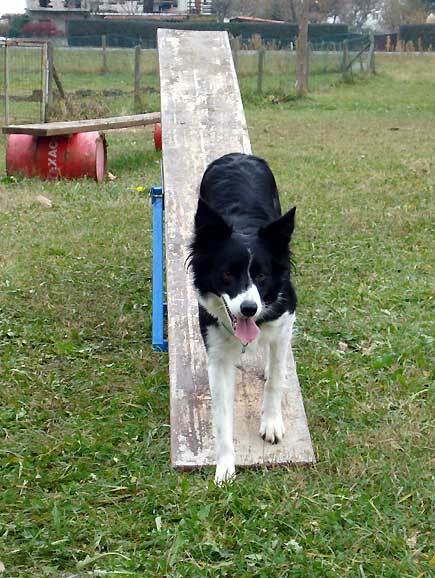 Obedience exercises were, surprisingly, done very poorly – Sara and Myf got only 42 points. They lost some point everywhere, mostly because Sara’s lowered concentration, because of which Myf played with retrieving object or totally lost concentration when passing group of people. Obstacles (dexterity work) Myf did it almost perfectly, loosing only 2 points in “Directability at the distance” exercise. Because she is really satisfied with how Myf works, Sara is seriously considering going to SAR World Championship in Romania this year. They gain enough points to qualify. At this test/competition Bruna and Loch also passed RF/FL-B test with more than 270 points, which is minimum to be eligible for qualifying to World Championship. Congratulations! After almost one year of training abstinence and after both Sara and Myf finished their maternity leave, this January they started with area search trainings. The first goal is already achieved: Sara and Myf passed area search test of 2nd level (RH-FL/B) with excellent mark. 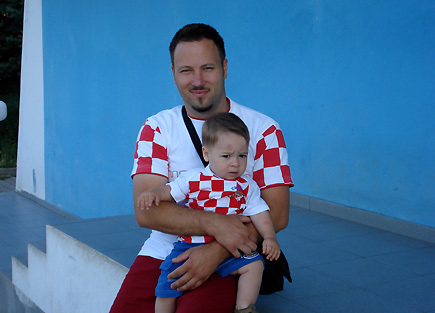 The test was organized by KOSSP-a Zagreb. The searching part was held in beautiful, but in some parts very dense wood near Jezdovec village. Myf got excellent 195/200 points in searching part of the test. This time Sara is very satisfied with Myf's intensity of working, her independence and the fact that Myf also reacted well on Sara's directional commands. The only thing Sara didn't like is that Myf sometimes shortly stopped barking while Sara was coming towards her and the hidden person. Sara realised that she has to train that more often with Myf. There were four persons hidden and it was quite challenging to find them (and even more to run to them and back :-)) in 20 minutes. That was maybe the main reason why only Myf and Darja's Mawlch Lynn, out of 6 candidates, passed the test. Obedience and dexterity work Myf did in her usual confident style and got 48/50 points for obedience and 47/50 for dexterity. Sara decided that she must teach Myf to wait (without a command) after a helper carries her away from Sara and must teach her to crawl better, because it is really stupid to lose points on that almost every time.